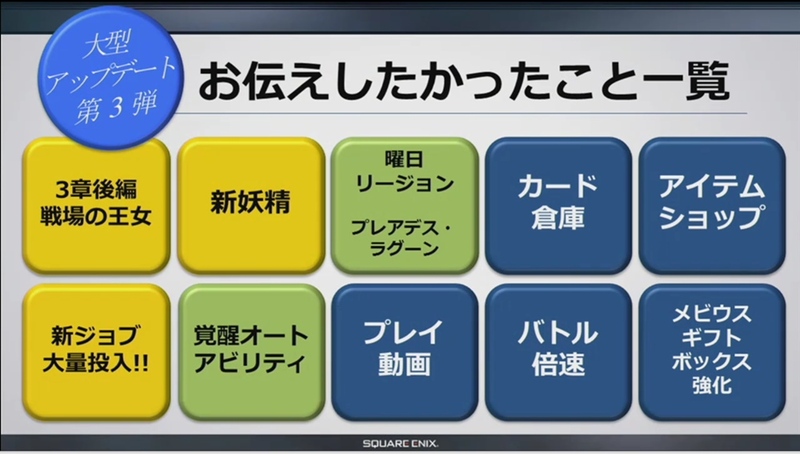 Square Enix held a live stream last night which presented a wealth of information regarding the upcoming mega update happening on September 1st. 😀 A quick recap and gallery of screencaps from the video feed is after the break~! A summary of topics that was discussed. I’m sorry about the quality of these screencaps. .__. It seems like we can choose between 2 paths? Garland and Wal in his souped up Samurai job. Yay. More Echos. Admittedly, I liked some of the swimsuit designs and these are cute too but I don’t care about her as a character. An option will be added that’ll allow us to exchange Familiar/Fairy Tickets for Revival Tickets. The ratio is 1:1. A new perk that’ll come with the Mobius Gift Box is Full Auto mode. Defense = use of Element Drives. Attack = use of Support Cards/Buffs. We can “customize” our cards with an auto ability we want. What ability we get is random. Unsure if this option is for 4-star or higher cards though. The material cards for awakening new abilities. The method of getting the new auto abilities is still through fusion. There doesn’t seem to be a success rate attached to it though so I guess it’s always guaranteed. The awakened auto ability strengthens wind abilities/skills by 1%. Finally, he obtained Experience Up which allows the player to enjoy an additional 5% EXP from battles. A new daily map will be added. This one will feature fearsome boss enemies that’ll drop awaken ability material cards. A battle with a series of Cockatrices! I sure would love the amounts of skill seeds and Magic Stones! Lucky developer/test accounts! But yes, notice the material card~! All currently available jobs will see upgrades with new costumes and stats. I’m not sure how they’ll implement them though such as through a 5th panel page or not. The only things I didn’t touch upon in the gallery were the gameplay recording option, card storage, and item shop. For the gameplay recording, the project producer just briefly pointed out the recording options and showed how it worked as well as the landing page for the recorded videos. In the screenshot of the results from the Cockatrice battles, you can see the little inset in the top left showing the ceiling of the room they were holding the live stream from. That’s from a recording in progress. ^^ I’m not entirely sure why you’d want to record a video of yourself talking but the option is there. The card storage seems to be an additional card box to put all cards that you’re not actively using or developing. I hope its default is 100 like what was shown in the video. One thing I’m really unsure about is the Item Shop since I switched out of YouTube when they were talking about it. But from the update notices in-game, it says that you can buy Elixirs and other useful things with Magic Stones. I’m stoked! It’s a pretty huge update with lots of new things! I’m particularly excited about the double (well, increased) speed option, card storage, and the new story chapter! I’m not all that sold on the Awakened Auto Abilities bit due to it relying on randomness. 😡 How many cards will I have to waste to get something I want? What is up with the new Dancer costume?